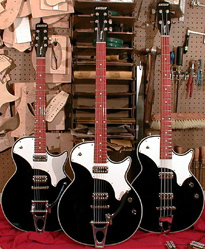 The Spectrasonic guitar was designed by TV Jones and inspired by an old Kay Tuxedo guitar that a customer brought in for repair. 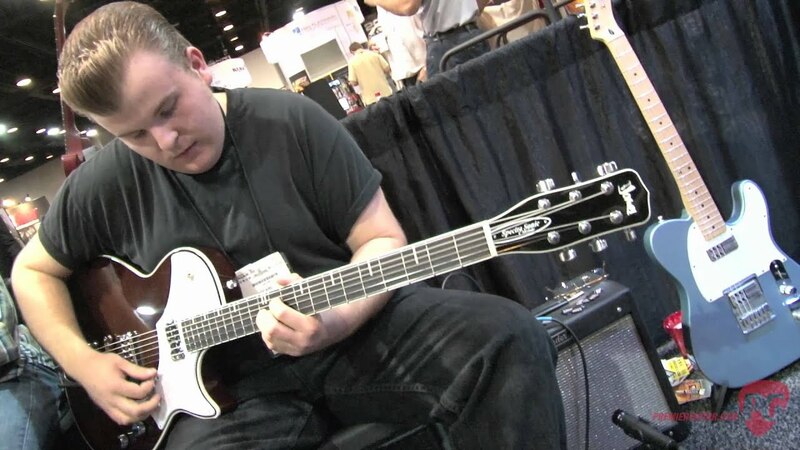 Thomas V. Jones is best known for the Gretsch inspired guitar pickups he makes, but in 2000 he partnered with the Gretsch organization and Brian Setzer's guitar tech, Rich Modica to create this guitar. The goal was to build a guitar that could be created in quantity, but maintain quality. The result was the Spectrasonic Lead guitar, the Spectrasonic bass and the Spectrasonic C Melody guitar. This guitar was originally designed with Brian Setzer in mind, however other artists have made this instrument part of their collection. Noel Gallahger, the Edge of U2, John Fogarty and the Reverend Horton Heat all own the Spectrasonic. 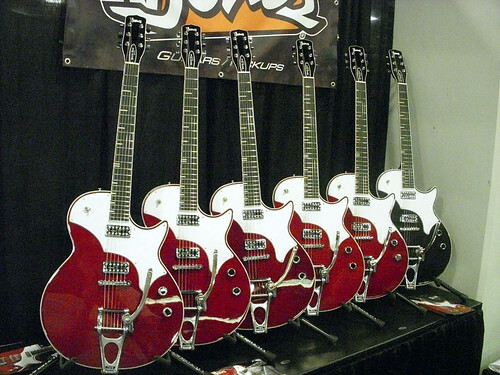 Most of the Gretsch Spectrasonic models starting around 2002 were manufactured in Japan, however the first Gretsch models were manufactured through Hamer. Many Spectrasonic players seem to prefer the Japanese made instrument. Two companies manufactured them; Fujigen gakki which has been in business in Matsumoku, Japan since 1960 and Terada which started in 1912 in Nagoya, Japan. Gretsch production ended in 2005. The US models are said to have a slightly wider neck. The guitars standard colour was black with a large white pickguard. It features 2 TV Jones Alnico PowerTron Humbucking pickups. The flat top body is chambered and made of Alder with a laminated spruce top. The 24.75 inch scale neck is made 3 piece laminated mahogany. Lamination gives the neck more strength. The fingerboard is made of African padauk wood and is topped with 22 frets and pearloid dot inlays. 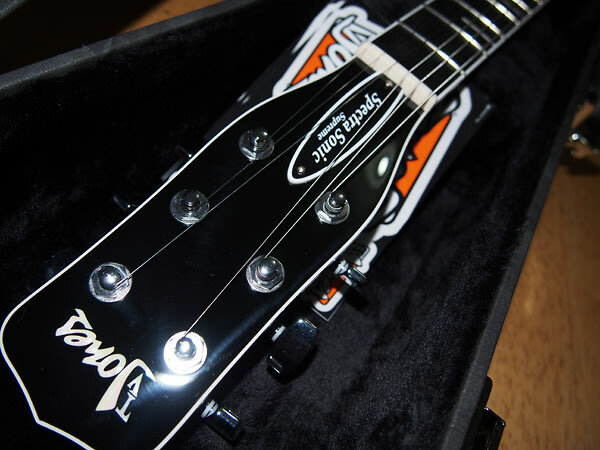 The Gretsch logo is inlaid on the headstock. The 15.25 inch body is bound. The body is 1.875 inches deep. The neck has position markers on the side. The bridge saddle is an adjusto-matic, which is Gretsch's answer to the tune-o-matic bridge. The strings are held in place with a chrome Bigsby B-12 Vibrato tailpiece. At the other end of the neck are chromed tuning key and an adjustable truss rod. The guitar joins the neck at the 16th fret. The controls consist of one volume and one tone knob on the guitars lower bout and a selector switch on the top bout. 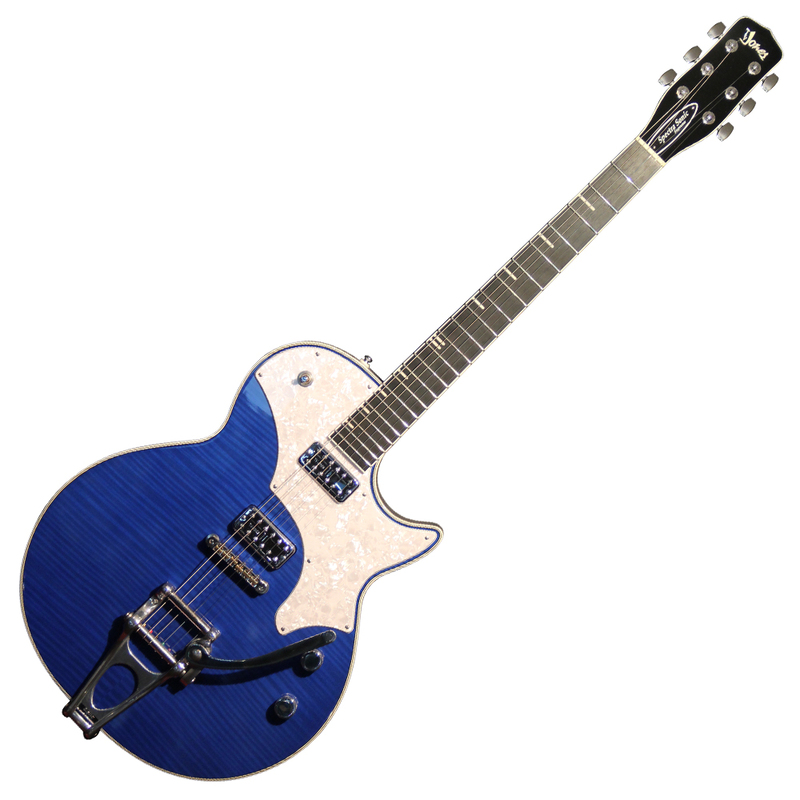 The Spectrasonic C Melody guitar, which is baritone guitar meant to be tuned to C on the first and sixth strings. The accouterments are similar to the Spectrasonic guitar. All of the models excetpt the bass feature Bigsby is a B-12 model tremolo. The longer neck on the C Melody is 29.25 inch scale. The Spectra Sonic bass guitar has all of the features of the first two models, but the 4 string 33 inch scale neck joins the body at the 15th fret. When Gretsch's licensing agreement ended Spectrasonic manufacturing was taken over by TV Jones. Some changes have been made and the guitar is now called the Spectrasonic Supreme to distinguish the upgrades. The finish is available in either charcoal black with a laminated flamed maple top or translucent cherry red, also with a figured maple top. The guitar undergoes a nitro-cellulose lacquer finish process. The pickups are TV Jones Classic humbuckers which have more low end than Powertrons. The same Bigsby Vibrato adorns the lower bout. The neck inlay features what Mr. Jones calls, Shoe-string potato fret markers. The neck has a 12" radius. The entire instrument is bound including the head-stock.The body is bound with w/b/w/b trim. The wiring harness, 500K potentiometers (tone has a .022uf capacitor) and selector switch are all made by Switchcraft. The knobs and switch cover are all made of aluminum. The white/black/white pickguard almost looks like part of the body. The 1.68 inch nut is made of a material called Delrin, which is slippery and prevents the strings from locking up, which not only aids with the Bigsby, but helps maintain tonality. The adjustable bridge saddle is a Gotoh ABR-1 model. All Spectrasonics are set up by Mr. Jones before leaving his facility. He inspects each guitar, matches the fingerboard and bridge radius and cuts the nut slots himself. Incredible!! 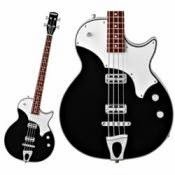 Plans are in the works to manufacturer the Spectrasonic Supreme C Melody guitar and Spectronsonic Supreme Bass. These guitars can be purchased directly from TV Jones at his Whittier California manufacturing facility and the price, $2625 includes a case. I say that is an excellent value for what is essentially a handmade instrument. Throughout the history of the guitar, luthiers have been trying to coax more sound out of this wooden box with strings. 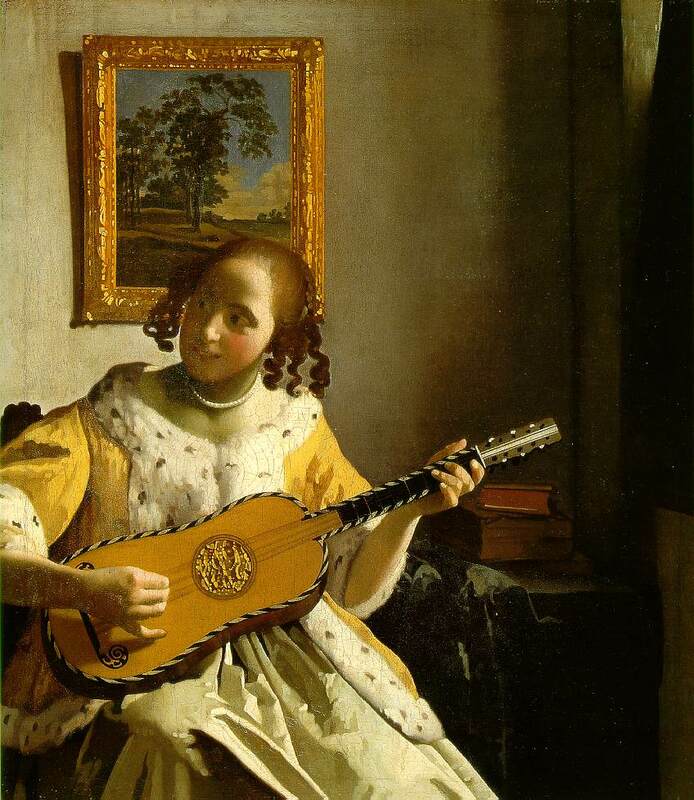 In the middle ages European guitars were tiny and meant to be played quietly by elite young girls in a parlor or music room. The first United States guitars were small "0" sized instrument, strung with gut string. Because of their historical provenance these came to be known as parlor-guitars. 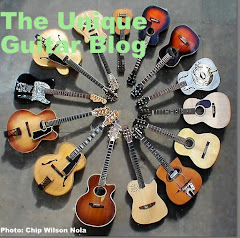 In the early 1930's, the modern guitar became larger and larger as it became a band instrument. Martin produced the first dreadnaught sized instrument. Gibson was competing with Epiphone and Stromberg to produce a larger archtop guitar, which would better project the instruments voice over the horn and drum section. Gibson's concept was similar for flat top guitars. The first models played by Nick Lucas and Robert Johnson were parlor sized Gibson instruments. In an effort to compete with Martin, Gibson moved on to produce the slope shouldered J-50 model. But players wanted louder instruments. Gibson answered the call with the super jumbo model. The first instruments were the SJ-200. The SJ-200 was a beautiful instrument, first produced in 1938 at Gibson's factory in Kalamazoo Michigan. It featured a 16 7/8" double braced red spruce flat top and rosewood back and sides. The top featured a red-sunburst finish. Nine years later the back and sides were changed to maple. Not many of these guitars were produced due first to the post depression ecomomy and later due to World War II's economy. This was a top-end instrument with a big booming voice. It is highly prized. The SJ-200's from this era, made of rosewood are prized above newer models. In 1948 the body depth was increased from 4 1/2" to 4 3/4". In 1952 the bracing was changed to two X braces, scalloped and projected to the guitars front. In 1955 the designation was changed from SJ-200 to J-200. The back and sides were made of laminated maple. In 1961 Gibson added an adjustable bridge and added a large wooden brace that ran under the bridge to the soundhole, which was screwed into the guitar's top. The neck block extended to the distal edge of the fingerboard. Perhaps this was done to make the guitar sturdier to decrease warranty work. Who knows? What it did was kill the guitars tone. In 1963 the neck was changed to a 5 piece laminate. This strengthed the neck. One thing that sets this model apart is the distinguished mustache bridge. It resembles an old fashion mustache, turned up on each end. It is made of rosewood. The bridge is highly decorative with mother of pearl or abalone and the strings are held in place by 6 bridge pins in a semi-cirular pattern ensconced by two mother of pearl dots. The pickguard is also highly decorative with a distinguished cut. The 25.5" scale neck is bound and the fretboard has block mother-of-pearl markers that start at the first fret. The neck joined the body at the 14th fret with a dove-tail joint. The neck was topped with a bound headstock that had a crown inlay below the Gibson logo. The nut and saddle were made of bone. The sound hole was encircled with dual rosettes. Gibson changed the designation from SJ-200 to J-200 in later years. By 1963 the guitar was available with a natural top and maple back and sides that were finished in transparent red stain. Later in the 1960's the guitar could be ordered with walnut back and sides. The line was discontinued in 1972 only to revived again by the companies new owners. The list of players who prefer the J-200 is very impressive. Ray Whitley, Emmylou Harris, Roy Rogers, Gene Autry, Gram Parsons, The Everly Brothers, Ike Everly (their father who was a wonderful fingerpicker) and Pete Townshend all play the Gibson J-200 Jumbo Acoustic Guitar. Emmylou Harris’s love of Gibson Jumbo acoustics is well documented. She started her career singing duets with country-rock pioneer Gram Parsons. Parsons prefered the J-200 and owned a 1960s model. Harris still owns this guitar and played it long after Parson's death. Ms. Harris owns a number of J-200's, the most famous in my oppinion is her all black model with a rose on the body. The other is her custom-painted pink J-200 which she used exclusively on her 1985 album, The Ballad Of Sally Rose. Infact, Harris’ career has been distinguished by her close association with Gibson. 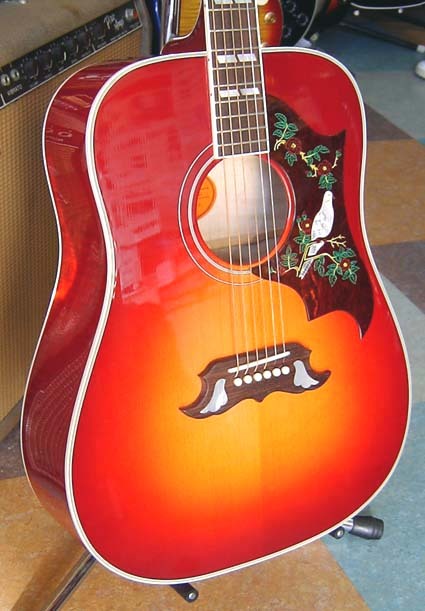 In 2002 Gibson has designed a model for her based on the J-200 and named it the Gibson L-200 Emmylou Harris acoustic guitar. This guitar is smaller and thinner than the J-200 model and based on the Gibson CJ-165, only it retains all the fancy aspects of the J-200 model. Another model that sprang off from the J-200 was the Everly Brothers guitar. Phil and Don both were playing J-200's throughout the 1950's when they got their start. They had customized these with twin pickguards. Based on the Everlys' success Gibson offered them a guitar that would really stand out. Gibson put together a guitar, which was actually based on the J-185, which was slightly smaller than the 200 model, it had a 16" body across the lower bout and had a plain rosewood bridge. The guitars were finished in glossy black and topped with two huge tortoise shell pickguards. The bound neck came with a rosewood fretboard that was topped with mother-of-pearl star inlays. The body was spruce and the back and sides maple. The neck was made of mahogany. These guitars really looked good against the brothers that typically wore black suits on stage. 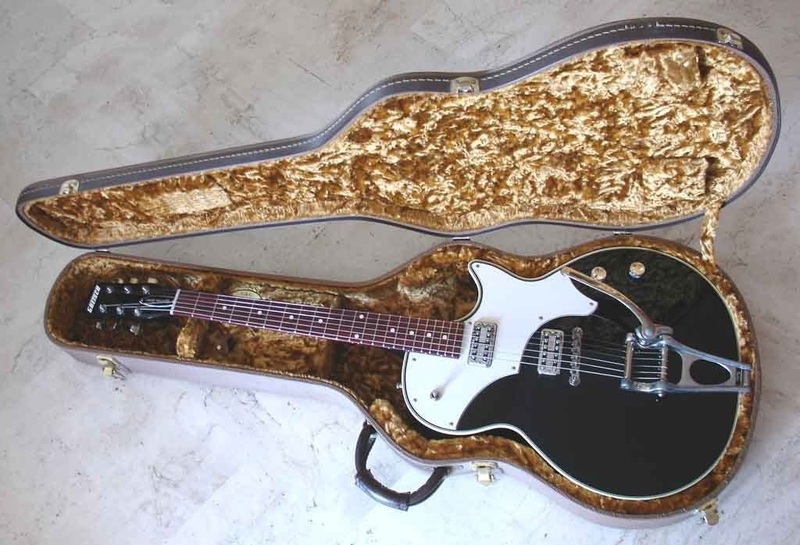 In 1963 the Everly model was offered in a natural finish with black pick guards. The Everly guitar lasted from 1962-1972 before being discontinued until 1986 when it was renamed the J-180. In 1994 it was renamed The Everly Brothers Model. The construction and quality of gibsons' SJ-200 and J-200 jumbo acoustic guitars during the 40s and early 50s are highly regarded and considered well made instruments. The instruments from the mid 1950's and 60's are considered somewhat inferior due to Gibson's use of an adjustable bridge and laminated back and sides. 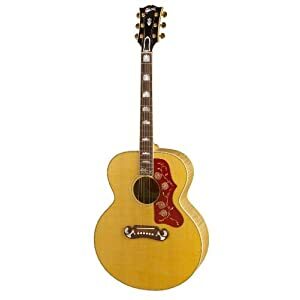 Gibson's current model for the most part has gone back to the original design, but feature gold rotomatic tuners instead of the ususal Waverly models. The guitar also comes equipped with a built-in Fishman Ellipse Aura electronics package. The J-200 is a super instrument that is big, loud and sounds and looks beautiful. Yesterday's Cincinnati Enquirer mentioned that a feature length film called The Black Dove is being shot in town and starting production today, Monday September 20, 2010. It stars Sean Young (“Blade Runner”), David Della Rocco (“The Boondock Saints”), Lou Beatty Jr. (“Fast & Furious,” “Fight Club”) and singer-songwriter John Brannen (“Somebody”). The film is about an ex-con (Brannen) trying to revive his music career and patch things up with his daughter, who has his black Gibson Dove guitar. Mike Caporale wrote the screenplay and is producing the movie. What a great lead-in for a great guitar story. In 1962 the flattop steel string acoustic guitar was associated with Country and Western music. This was an era of cowboy and western based TV shows and movies. Many TV stations throughout the nation produced local country western shows. The Country singers all liked their guitars to look fancy and the 1962 Gibson Dove was a beauty. The Dove guitar was first made in the Kalamazoo, Michigan site, which was the home of Gibson Guitars. It was Gibson's second square shouldered guitar. The first square shoulder model was the Hummingbird. Both instruments were based on Martin's popular Dreadnought guitar shape. Although the Hummingbird and the Dove appeared to be similar instruments except for the differing fancy pickguards, they were really quite different. Both had solid spruce tops, but while the Hummingbird used solid mahogany for it's sides and back, the Dove utilized solid maple sides and back. Gibson used a lot of maple, perhaps because it was locally grown and readily available. The Dove had a 25.5" scale from the nut to the bridge saddle, while the Hummingbird's scale was 24 3/4". The neck scale and the use of maple gave the Dove a brighter and louder sound. The Doves neck itself was made of 3 pieces of maple which provided strength. The neck was capped with either an ebony or rosewood fretboard. The Dove's unique downward mustache bridge really makes this instrument stand out. There are a pair of Doves made of mother of pearl that adorn either side of the bridge. 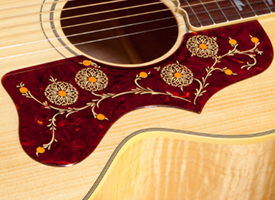 A mother of pearl Dove is also inlaid on the engraved and highly figured pickguard. In 1962 Gibson offered the guitar with a a tune-o-matic bridge saddle. Some people love the acoustic tune-o-matic and some people hate it and say it has an adverse effect on volume and tone. In 1969 Gibson replaced this with an adjustable bridge saddle that had twin screws to raise or lower the action. From a distance you can distinguish these two models since the bridge pin placement is sort of semi-circular. The adjustable model lasted only about a year. In 1970 Gibson redesigned the bridge and saddle utilizing a non-adjustable slanted bridge. They also simplified the bridge. Originally the Dove bridge was beveled on either side and was routed out for placement of the "doves". The 1970 bridge retained the downward mustache shape, but had no bevel, nor did it have the two additional dot inlays. The bound neck on the Dove bore double parallelogram fingerboard inlays as fretboard markers which started at the first fret. 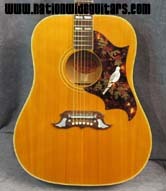 In 1970 Gibson changed the guitar's name to the Gibson Dove Custom. In 1992 Gibson moved it's acoustic instrument production site to Bozeman Montana and the Dove was a regular production item up until 1996. Although it could be custom ordered, it did not make it back into the line-up until 2007 as one of Gibson's Modern Classic Guitars. The Modern Classic Gibson Doves featured bone nuts and Tusq bridge saddles. There was a new neck radius as well that set the action lower. Some have complained these features caused volume problems. Although Gibson did custom orders and one-offs, the standard finish for the Dove was either Cherry sunburst or natural through 1986. In 1987 through 1993 Doves were only produced with a natural finish. In 1994 through 1996 they were available in Cherry sunburst again. The standard color for the back and neck of the Dove was a transparent cherry finish. Now let's get to The Black Dove or Ebony Dove. In 1976 through 1977 Elvis Presley did a tour and used a couple of Gibson Dove Guitars, thus causing it's popularity to go up a couple of notches. One of his Dove's was cherry sunburst. 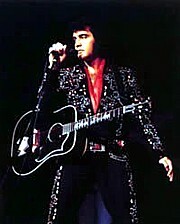 The other Gibson Dove was a customized ebony model from 1969, with Elvis Presley engraved across the fretboard. This guitar's mustache bridge was adorned with the usual mother of pearl doves. The 2 ply pickguard was black with white trim, to match the body and neck, which were also bound in white trim. The body and neck bore a glossy black finish. Elvis placed a Kenpo Karate decal in the center of the body's lower bout. The truss rod cover on the neck was also black. Elvis gave one of his black models away to Mike Harris. The serial number is 539461. Harris has offered it for sale for $200,000 on eBay. The top bid was $85,000 and Harris rejected it, pulling off the market. Gibson in cooperation with Elvis Presley Enterprises now offers the Elvis Presley Dove in it's current line-up with a street price of around $2900 which is probably at least 10 times as much as they cost in 1962. You are going to have to find your own Kenpo Karate decal as this is not included. You'll need to purchase your own matching jumpsuit. Starting in 1985 Gibson did offer some custom models starting with the 90th anniversary Dove model. Gibson commissioned master luthier Ren Ferguson to create a guitar line called "Doves in Flight". This guitar displays 28 individually engraved in-flight dove inlays—seven on the headstock, 16 on the fingerboard, three on the pickguard, and two on the bridge—each with its own original design, and all hand-cut from genuine abalone pearl. The suggested price of this instrument is $7500. But it is a work of art. The current standard Dove model was available from Gibson for street price of $2900 at this writing. Gibson's Epiphone division also produces the Epiphone Dove. This is a replica of the Gibson Dove and comes with a solid spruce top and laminated mahogany back and sides. The suggested price for this guitar is $490 with a street price of $299.